Knopf Books for Young Readers, 9780553496581, 32pp. 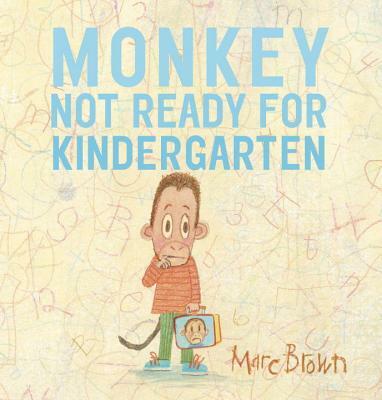 Marc Brown, creator of the beloved Arthur books and TV show, offers a charming new character—and a fun and reassuring story about preparing for the first day of school. Kindergarten is only a week away . . . but Monkey is NOT ready. What if he gets on the wrong bus? What if they don’t have any red crayons? What if he doesn’t like the snacks? What if he doesn’t make new friends? There are so many thoughts running through Monkey’s head! But step by step, his family eases his worries: they get him a new backpack, help him read books about school, prepare his lunch, and make sure Monkey is excited—and ready—for the Big Day. MARC BROWN is the creator of Arthur, the aardvark star of many books and a six-time Emmy Award–winning PBS television show. He is also the author and illustrator of In New York, as well as the illustrator of Wild About Books, Born to Read, Zoozical, and Wild About You!, all by Judy Sierra, and Dancing Feet! and Farmyard Beat by Lindsey Craig. Marc and his wife, the artist and psychologist Laurie Krasny Brown, live in New York City and on Martha’s Vineyard in Massachusetts. You can visit him at MarcBrownStudios.com.